In the Greater New York Metropolitan area, the Jews who emigrated from Zelva formed a landsmanschaft in 1907, called the Zelver Benevolent Association, which continues to exist and function to this day. Like countless other organizations of this type, the Zelver Benevolent Association was a means for immigrants of a common background to band together for their common good in a strange, and often forbidding new country. 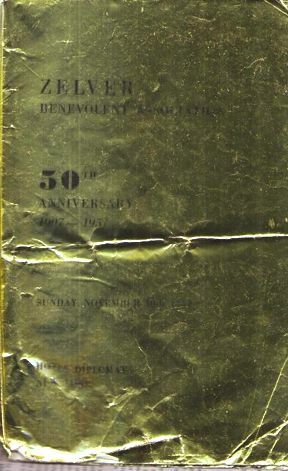 Through it, its members secured burial plots to inter their deceased, arranged for medical services for their ill, provided financial assistance to those who became economically distressed, and created a mechanism by which they could meet socially, and stay in touch with one another, even if they began to spread apart geographically. The Zelver Benevolent Association has two burial plots in the New York Metropolitan Area. The first is located in the Mt. Hebron Cemetery of Queens, NY and was purchased in 1917. This modest parcel was soon used up and required that a second parcel be procured. 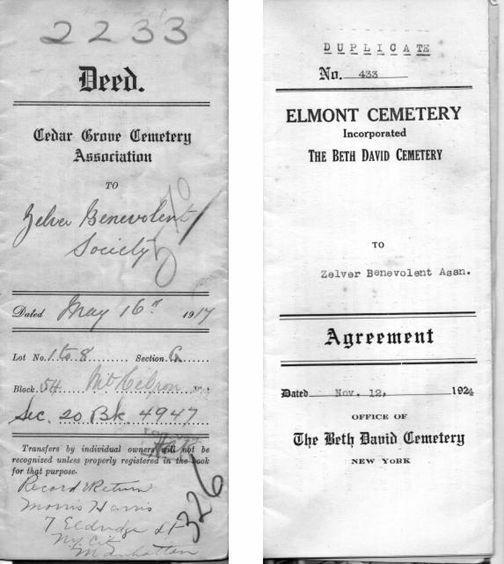 The second parcel is the one found at Beth David Cemetery in Elmont, NY on Long Island, and was acquired in 1924. It is the one most familiar to the current generation of Zelva descendants. Below are facimiles of the original deeds of purchase. They were held for many years by Isidore Freed, who was the President of the Zelva Benevolent Association at the time of the second acquisition. When he passed away, these papers came into the possession of his daughter, Beatrice Melnick, who recently turned them over to Jack S. Berger, the Family Chronicler, for archiving. Of special interest to the Freidin Family, are the several members of our family who took leading roles in this organization over the half century. We have already noted that Isidore Freed was a past President. So was Samuel J. Dinnes, husband of Ida Freidin Dinnes, called Chaya Laskeh's by her contemporaries, using a common Yiddish vernacular to associate her with her mother, Laskeh Helig Freidin. She was a sister to Charles Freed, who, as can be seen, served as the Hospitaler. In addition, Morris Freed, younger brother of Isidore was variously a Hospitaler, and at this occasion a Trustee. Of special note is the role played by Abraham Nosatsky, who served as both Secretary and Treasurer of this organization for well over a half century. Indeed, when he passed away, this role was taken over by his daughter, Ruth B. Roth, who administered the affairs of the organization from her retirement home in Florida for many years.